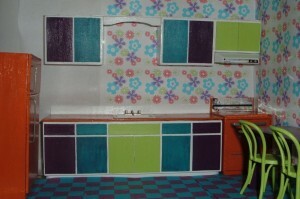 I put together an extremely crude mock-up of my 70’s kitchen. I say extremely crude because the wallpaper and floor are only taped in place as are the wall cabinets. I still haven’t done any work on the house itself, but it has been fun playing with the furniture. I think I have something that is close to the picture in my last post. Without the pink. I am not a pink fan. This kitchen is built from a Realife Kitchen Kit. I put together a number of the kits when I first started doing miniatures because they were cheap. What I had forgotten between that time and this was that they are cheap for a reason. The wood is very thin and quite prone to warping. I also opted to skip some steps which make the kits a whole lot more complicated than they need to be, such as making the front of the cabinets with pieces of strip wood and fussing with the refrigerator shelves (the fridge is glued shut). 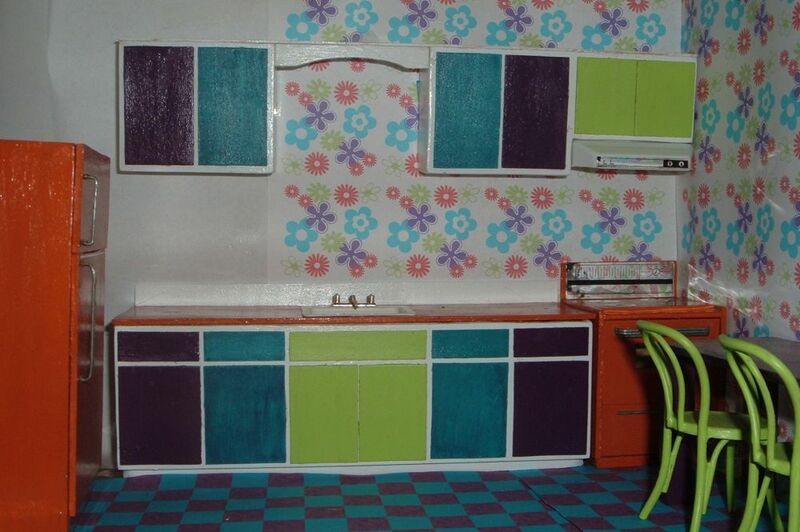 Overall, I am pleased with the way the kitchen turned out. I really need to get to work on the house! You are currently browsing the Manor Minis and More blog archives for February, 2012. What Is Bry-Back Manor And What Does It Have To Do With Miniatures?